In many countries, the men and women who pluck tea leaves wear a type of sleeve made from a light canvas, which covers part of the arm. Camellia is quite a tough shrub, and at the end of the day, without this protection, which can be worn directly on bare skin or over the top of a garment, the pluckers’ arms would be covered in scratches. 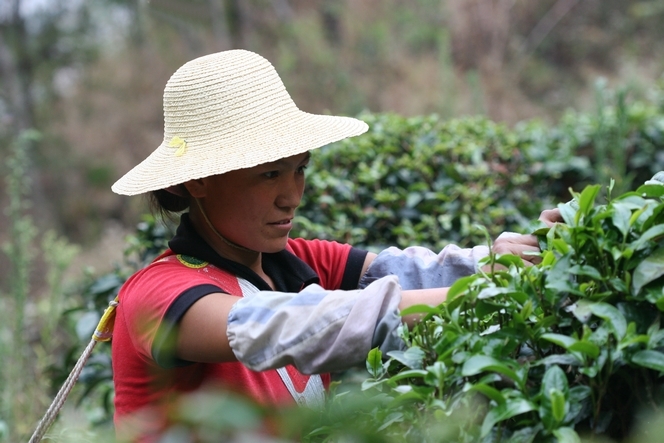 I expect this young woman from Yunnan, who looks rather stylish beneath her straw hat, would agree.